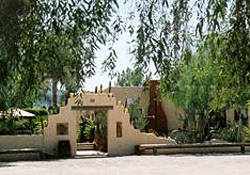 Welcome to the White Stallion Ranch Bed and Breakfast in Tucson, Arizona. 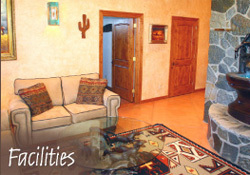 A ranch home on five-square miles of the lush Sonoran Desert adjacent to Saguaro National Park. 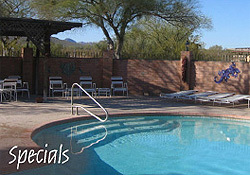 We offer a variety of comfortable rooms and suites and many convenient amenities. Experience a working ranch in comfort. Enjoy an evening stroll through our extensive cactus garden or watch our Longhorn cows bringing in their calves for water. Enjoy mountain views that brought Hollywood here for 24 feature films and the TV show "The High Chaparral." Enjoy a ranch with modern conveniences only 5 - 10 minutes away. 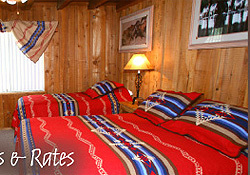 Make your reservation today and experience our rich ranch history and a restful bed and breakfast retreat.